Art making is an important part of the LUPA approach as the visual arts provide ingredients for a successful learning process such as curiosity, imagination and critical thinking. 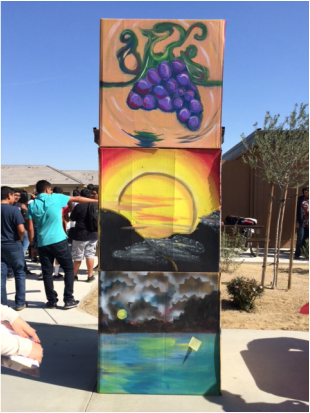 Students from the Art Department at the Coachella Valley High School, formed an impromptu art collaborative called "CV Artisans" to engage with the LUPA project. After participating in a joint meeting with students from NOVA and CV High School , the Artisans, have developed a mobile/ ephemeral public art installation that codifies many of the concepts all the LUPA participants have learned about land use planning, CV Link and affordable housing.